What’s the correct way to pull yarn from a skein? 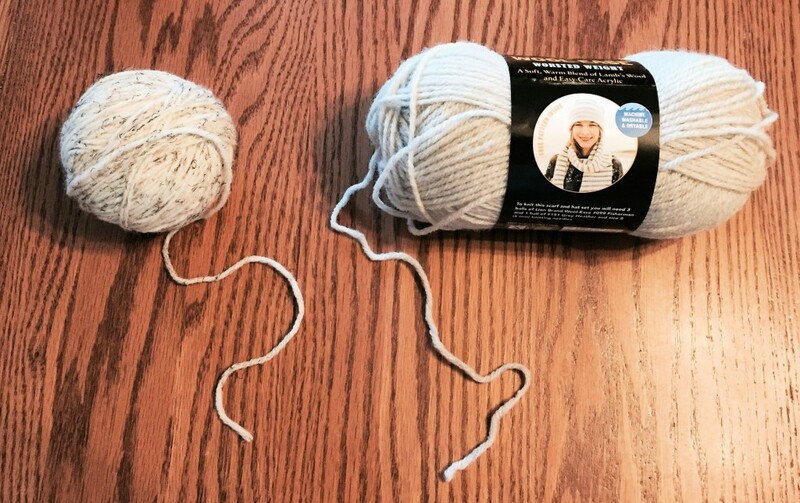 My husband and I have a minor running disagreement about whether you should pull yarn from the outside or the inside of the skein. John prefers to pull yarn from the center because he says it is neater, while I prefer to pull it from the outside, even though that means the ball of yarn inevitably flops around like a fish on my couch when I don’t wind it into a ball, or rolls onto the floor beneath my chair or coffee table when I do. So, who is correct? Apparently you can use either method, depending on how the yarn is wound. Those methods involve ball-wound, skein-wound, and hank-wound yarn. On the other hand, Red Heart points out there is a big difference between balls of yarn and skeins in the way they are used. 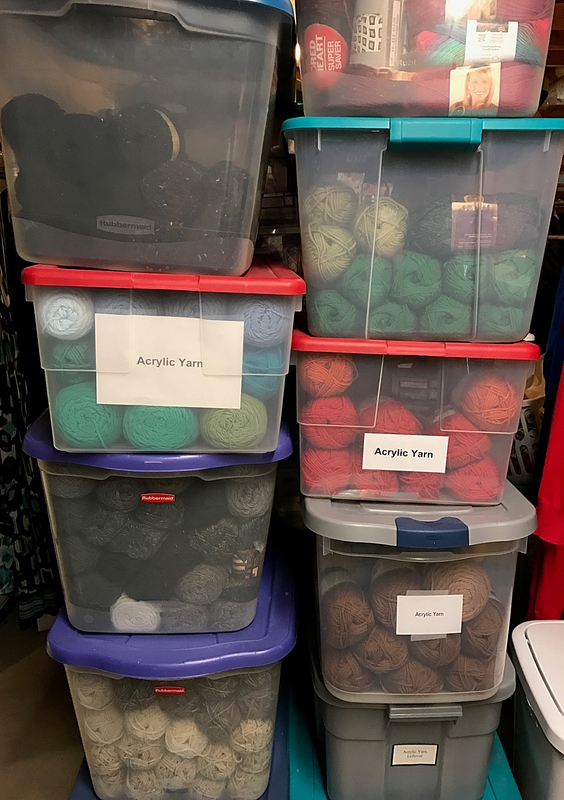 The yarn manufacturer says it winds some of its yarns as balls, and others as skeins. The balls are rounder and shorter, intended to be pulled from the outside. Red Heart skeins, in contrast, are long and tubular, intended to be pulled from the center. 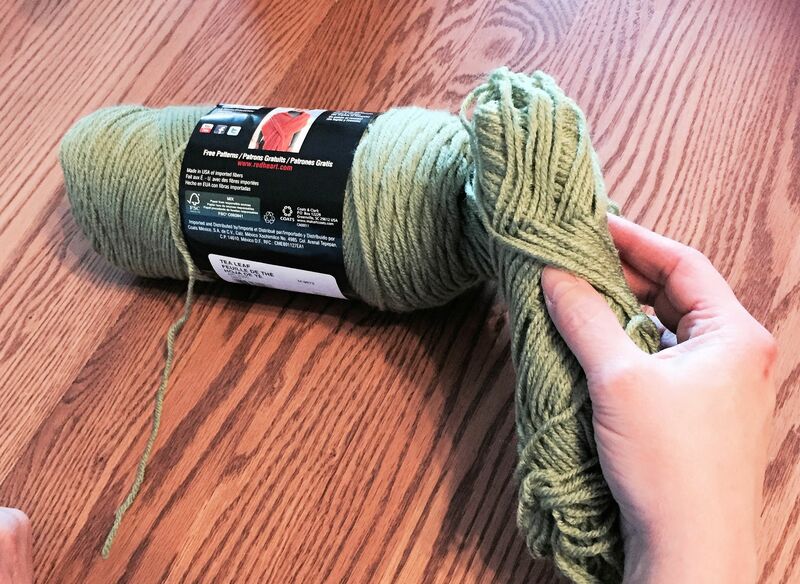 While looking at the yarn label from a reading point of view, pull the end of the yarn, located beneath the label, to the left for about six inches. Then go to the right end of the skein to pull out the other end of the yarn. Otherwise the two ends can tangle. 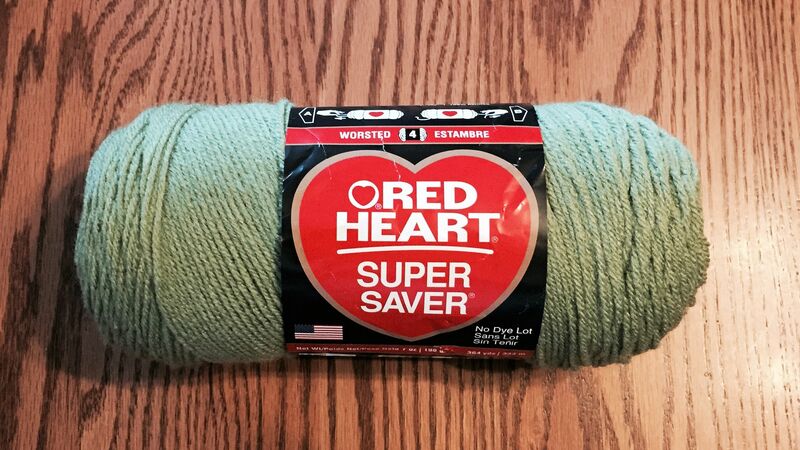 An example of a Red Heart skein is its Super Saver line. 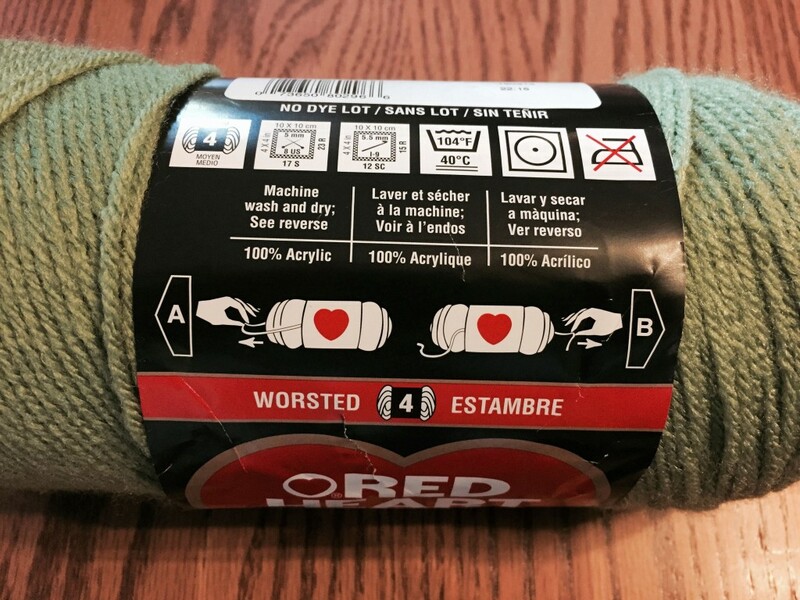 Red Heart makes it easy to figure out whether you’re dealing with a ball versus a skein because a skein’s product label provides an illustration that guides you in pulling the yarn. 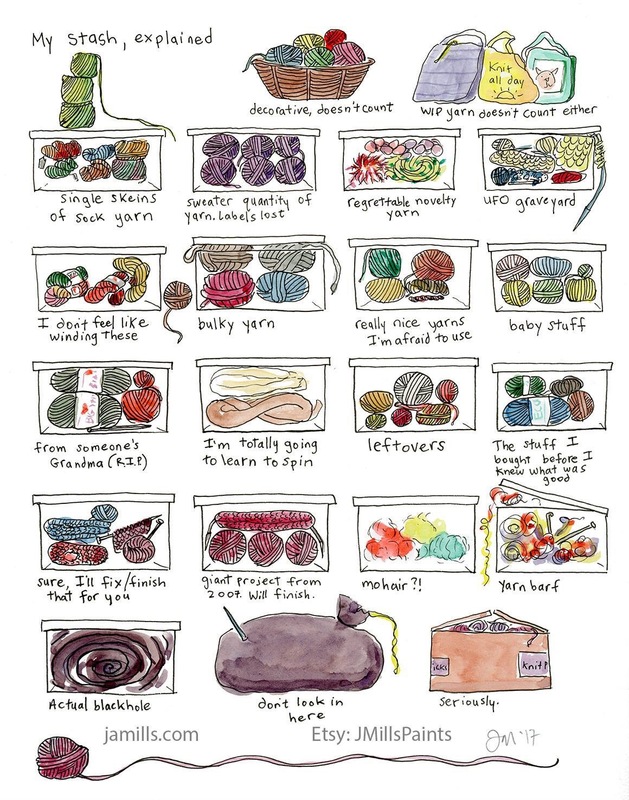 If you have an older Red Heart skein, however, this diagram is missing. 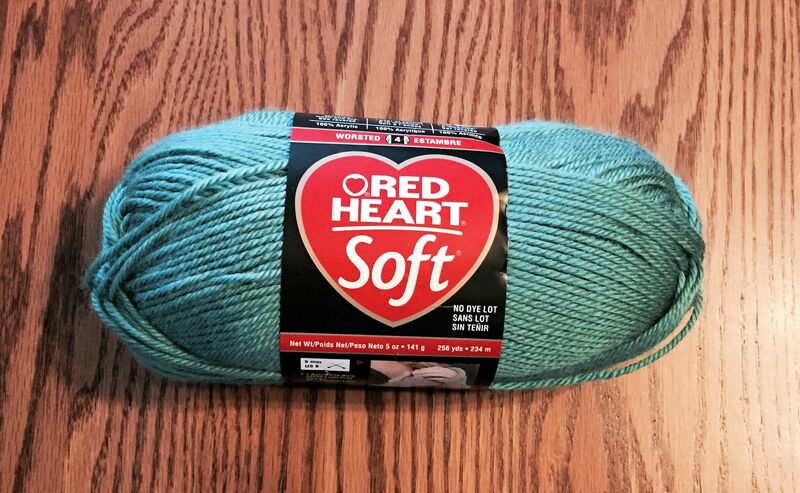 So, what if you’re dealing with a brand of yarn other than Red Heart? Lion Brand Yarns says that most of its yarns are center-pull ones. It advises you to look carefully for the direction the yarn end is pointed beneath its label when you pull it out, then go to the opposite end of the skein to pull out the other tail. To locate that tail, pinch the yarn between your thumb and forefinger on both ends of the skein, until your fingers meet in the center of the skein, and then pull out the yarn. 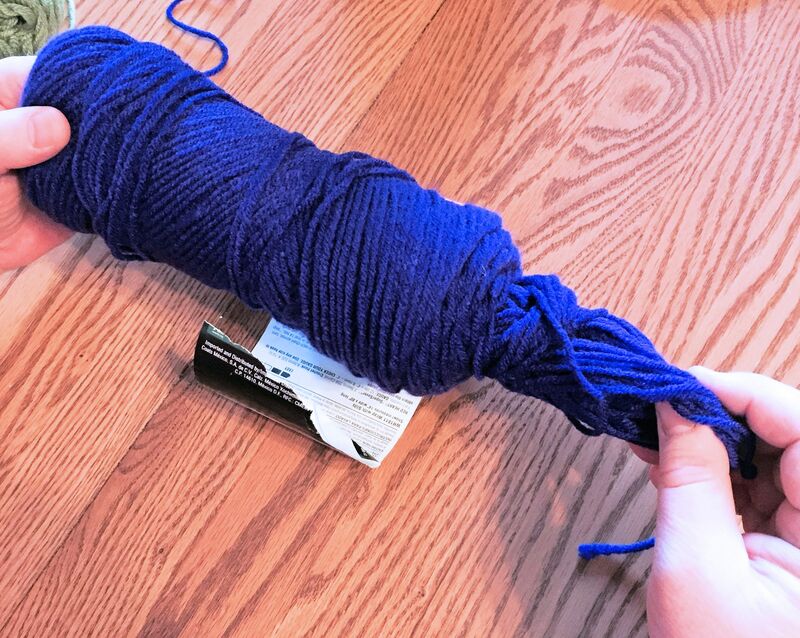 Yes, you’ll have a “wad” of yarn that comes out all at once, but you can wind it into a small ball that you can work with immediately, and then continue pulling from the center of the skein once you use up the small ball. Because I’m not as accustomed to pulling out the yarn from the center of the skein, I probably pulled out too much in the first photo. John pulled out less yarn than I did in the second photo. I pulled out too much yarn from the center of this skein, but it’s not a big deal, since you can simply work from this “wad” first, then continue to work from the center of the skein. John pulled out less yarn than I did from the center of the skein, but ideally you should pull out even less. 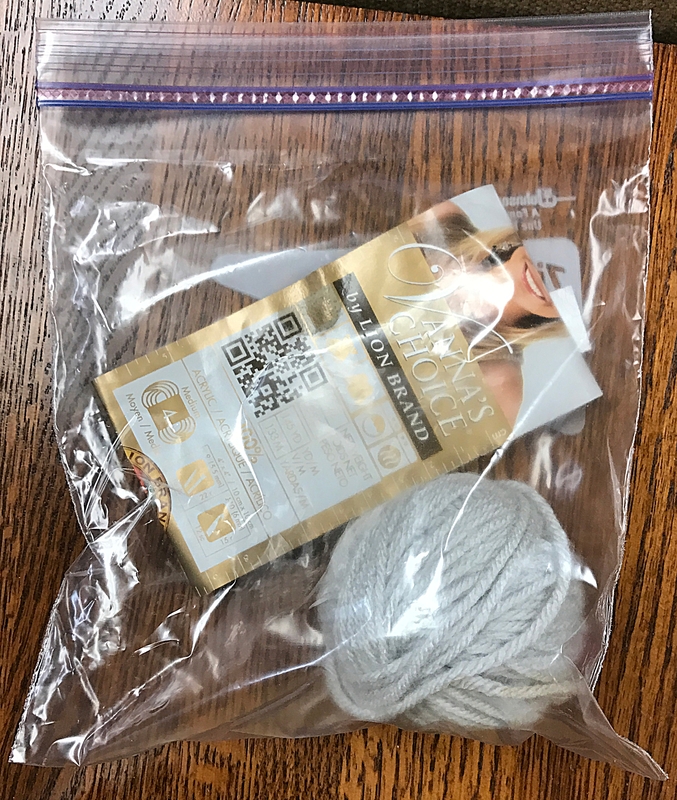 Lion Brand Yarn’s advice likely will work with most skeins of yarn, but not hank-bound yarns that you’ll frequently find in independent yarn shops, many of which will offer to wind the yarn at no cost into a center-pull ball using a yarn swift. 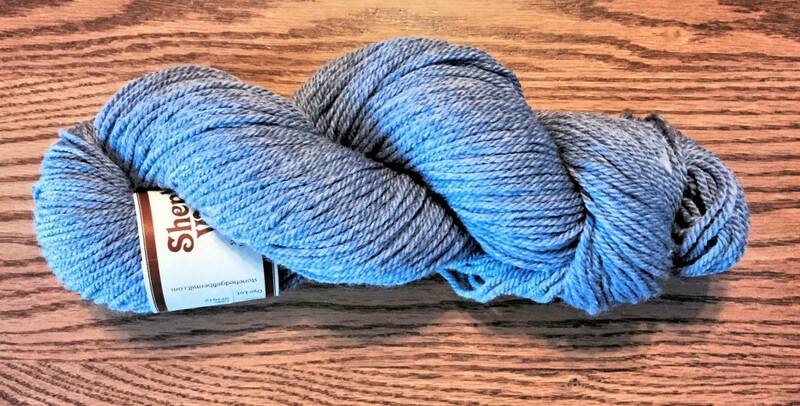 I haven’t begun working with this hank of yarn just yet, so it is not wound into a ball. 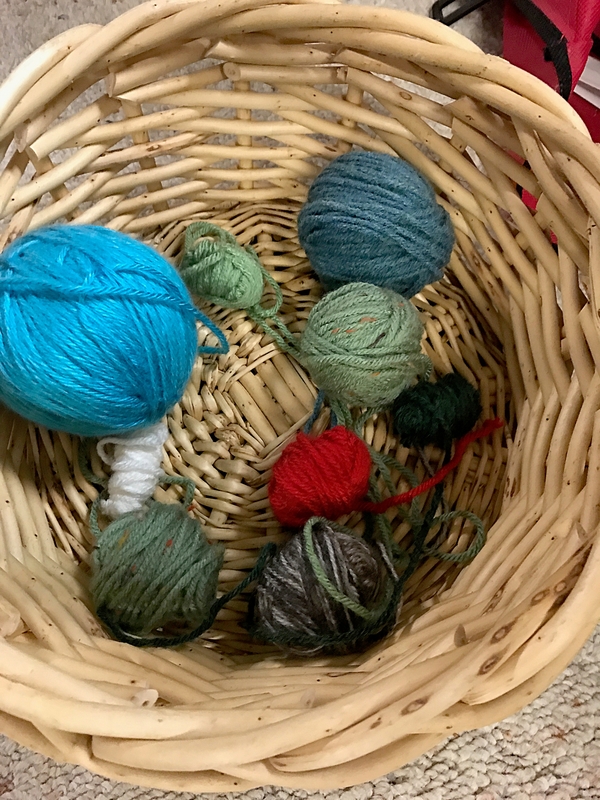 You can also create your own center-pull ball of yarn by untying or cutting the yarn (or paper band) that holds the hank together, usually in several locations, causing the yarn to form an elongated loop. You’ll want to retain that shape so that the yarn doesn’t knot itself into a hopeless mess before you get a chance to wind it into a ball. 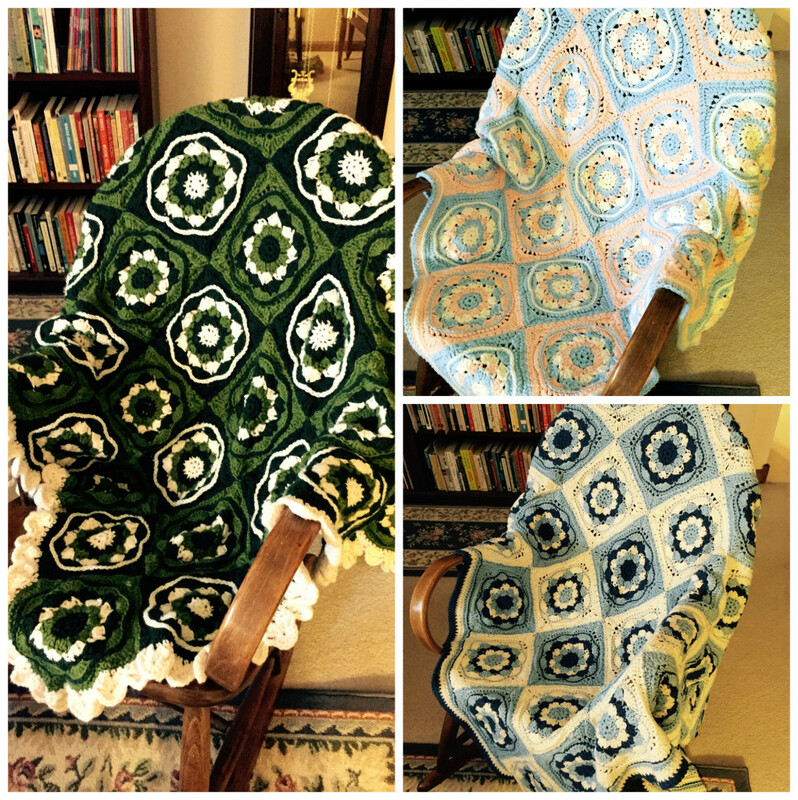 Drape the yarn around a chair back to keep it from tangling. Extend your thumb and forefinger on one hand, anchor one end of the yarn beneath the other three fingers, and then wind the yarn figure-eight style around the two extended fingers until you run out of yarn. There’s a nice photo tutorial called Hand Wind a Ball of Yarn on Instructables that shows you how to do this. An alternate method of winding yarn, if you prefer to have a ball of yarn that pulls from the outside, as I do, is to follow the instructions on the Craftsy Web site, Learn the Easiest Way to Wind a Hank of Yarn Into a Ball. Basically, you begin wrapping yarn around your forefinger and middle finger, then remove the yarn after a few windings and wrap your yarn a few times in a different direction. Every so often, switch your winding direction until you end up with a ball that looks like the one shown on the left side of the first photo in this post. The Craftsy site advises you, however, not to wind yarn into balls until you’re ready to work with it, as this can cause the yarn to stretch out of shape over an extended period of time. There are some special yarn holders that are designed to keep your yarn in either ball or skein form. These holders keep the yarn from tangling, rolling away or getting dirty. 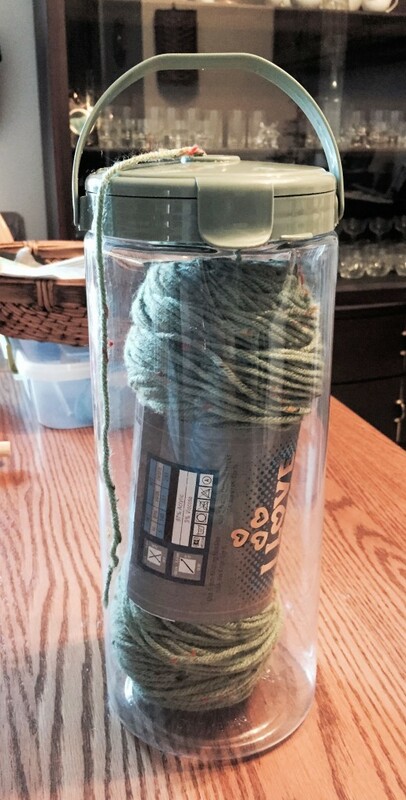 The cylindrical acrylic holder shown below is ideal for center-pull, tube-shaped skeins. The lid has a hole in the center from which you can pull yarn out of the skein. You can use an ordinary serving bowl to hold a ball of yarn, or purchase a glazed ceramic or stoneware bowl that sports a slot to keep the yarn in place and helps control tension. John bought me a beautiful one for Christmas, but I confess I bumped it with my foot—not very hard—against a coffee table, and it shattered into several very sharp pieces. 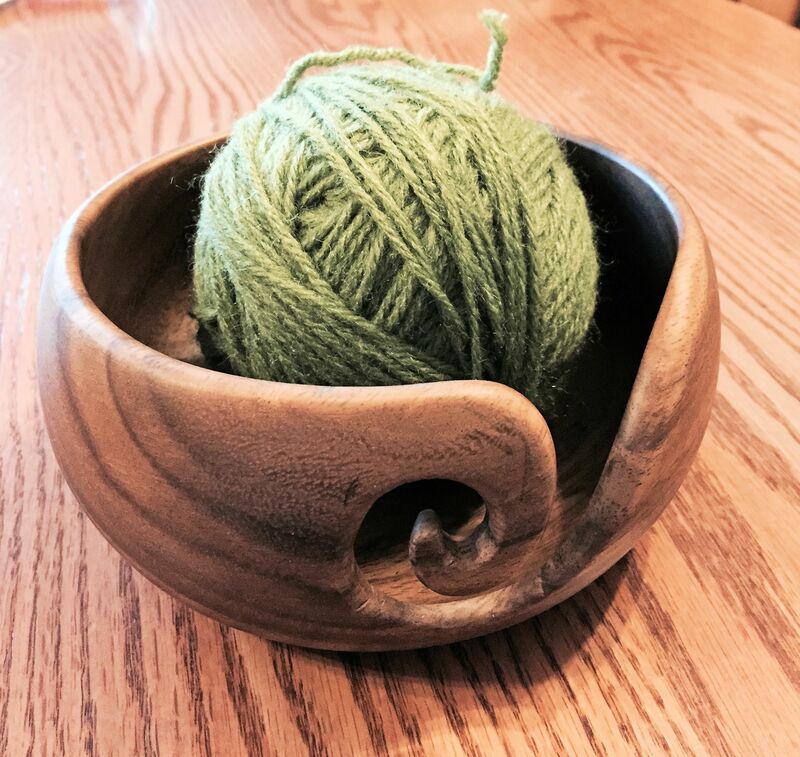 As much as I love the look of ceramic and stoneware bowls, I realized that for me one of the Furls Crochet acacia wood yarn bowls, lightweight but sturdy enough to tuck into a yarn bag when I travel, is a better option. At the time this post was written, by the way, those bowls were on sale. 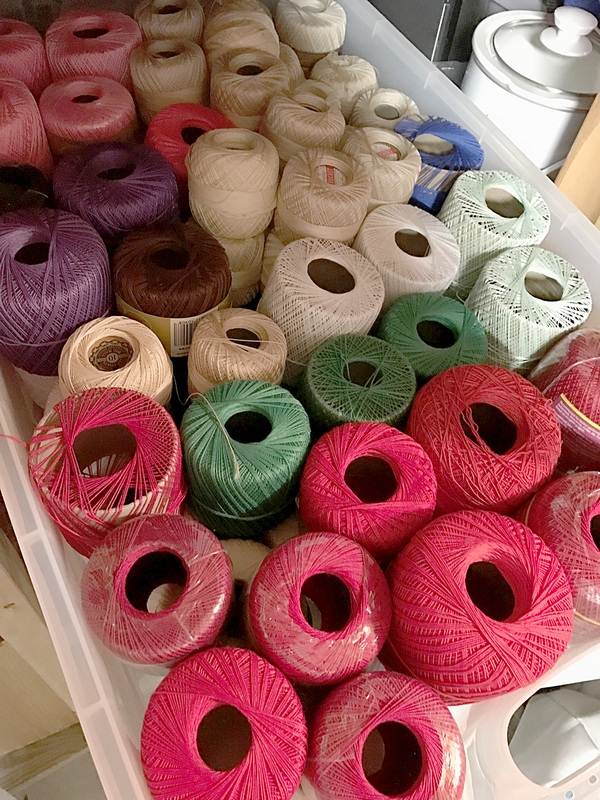 It turns out that there is not a single answer to the question of whether you should pull your yarn from the center or the outside of a ball or skein of yarn. What do you prefer to do? You wonder sometimes if opportunities seek you out, or if it’s the other way around. Once upon a time I thought I would become a teacher, specifically a German language teacher. Although that never happened, at least not officially as I never obtained teacher certification, I discovered many opportunities over the years to provide instruction or training. As you know if you regularly read my blog posts, I love to write tutorials. Beyond that, however, I have had the privilege of providing German language lessons to elementary students as a volunteer, tutoring individuals in German at my kitchen table, and developing lesson plans and then teaching enrichment or extracurricular classes for gifted grade school students in fine arts, science, social studies and literature. 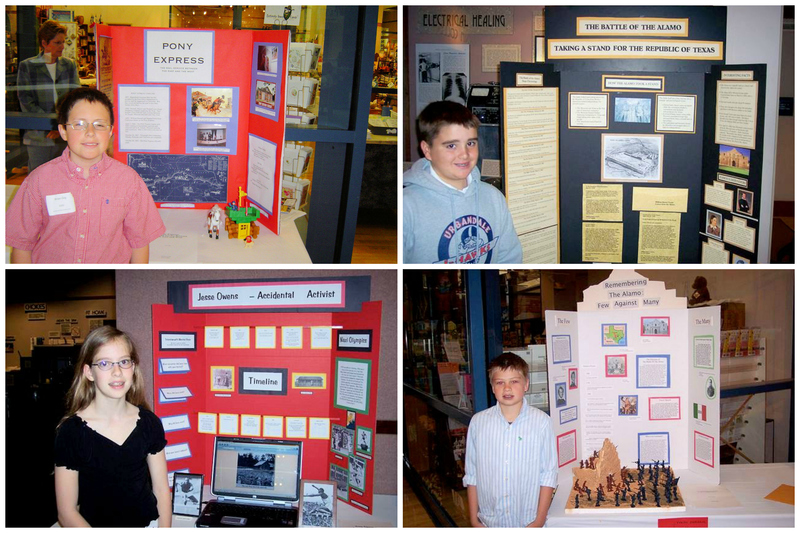 These photos represent National History Day projects for elementary students I taught. I spent a dozen years developing and teaching young people and adults about creative problem-solving tools through the Destination Imagination program, which sometimes led to other opportunities for the students. For a couple of summers, I collaborated with the Des Moines Art Center and the Iowa Architectural Foundation, who offered several Destination Imagination teams the opportunity to participate in the Ideal Object Workshop. One summer four teams participated in three workshops as they explored the definition of art, learned how art, architecture and everyday objects can be combined, and were challenged to create “Ideal Objects” matching the spirit of artist Tom Sachs’ exhibition that was on display at the time at the Des Moines Art Center. 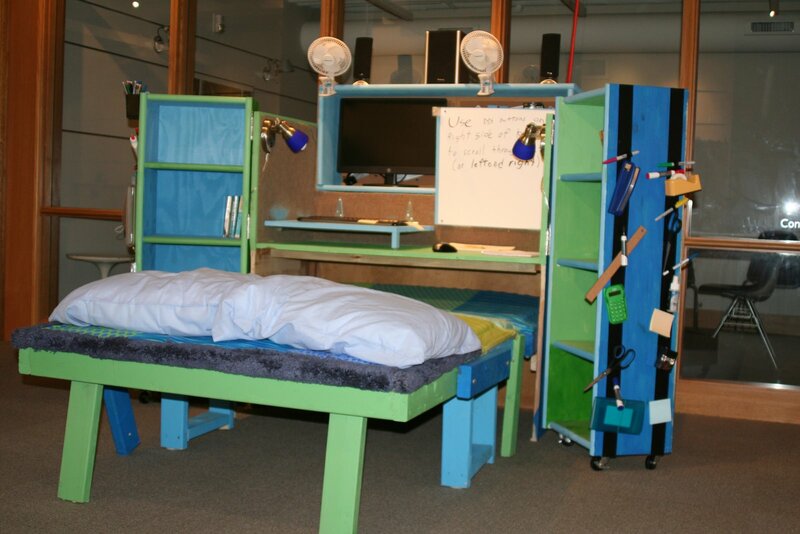 Students worked as both designer/contractors and clients, creating objects designed to make their lives easier within the kitchen, bathroom, garage and bedroom. Each team built an object for a room in a house that addressed three requests of a client (which just happened to be another team in the workshop). Students were provided with funds and the guidance of an architect and a contractor to help them work toward their Ideal Objects. 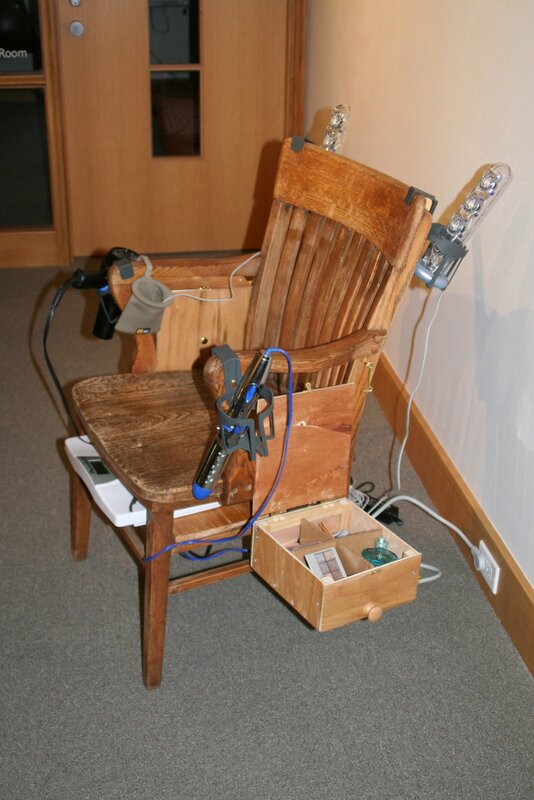 At the conclusion of the program, the students’ projects were displayed at the Des Moines Art Center and the Adrienne and Charles Herbert Galleries. 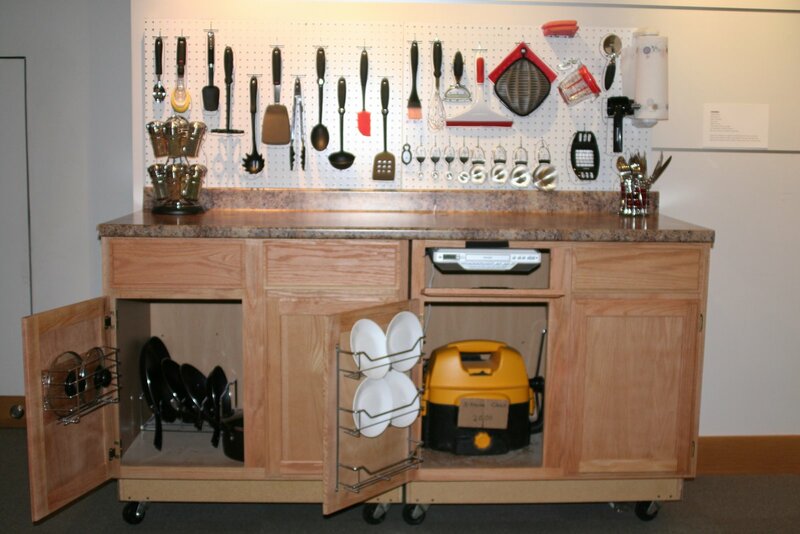 Designing the X-treme Clean Machine 2000 for its client, Ames Middle School, “Cakewaves,” a team from West Des Moines, created an Ideal Object for the kitchen that has the ability to clean, play music and store items. Producing a unique bathroom chair for grooming and grooving for its client, “That Team From Grinnell,” Ames Middle School created an Ideal Object that can dry, weigh, play music and includes distinct primping areas for boys and girls. 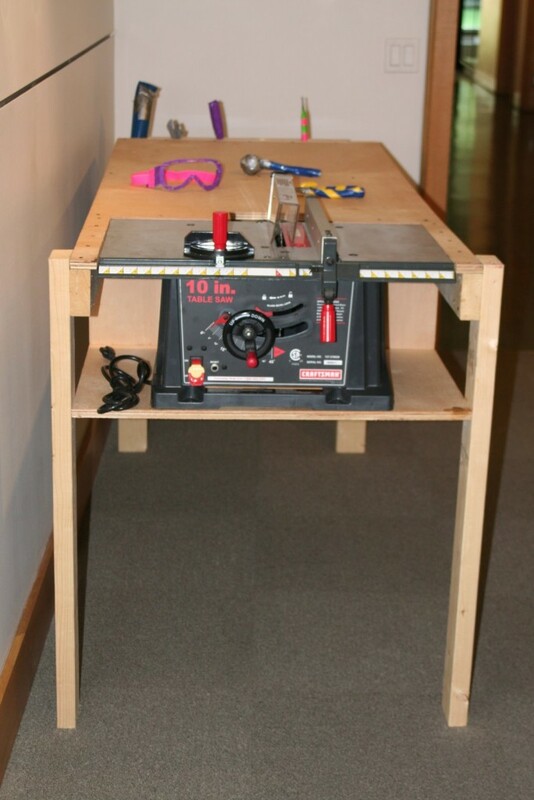 Crafting a workbench for the garage with a ping-pong ball warning system for its client, Ames High School, was “That Team From Grinnell.” Their Ideal Object incorporates a workbench with built-in tools, has additional areas for tool storage, and has a means for stopping a car. Before our son was born, when I was a software support specialist, I even taught adults how to use word processing programs. Let’s face it, with or without the certification, I’m a teacher at heart and in practice. What has touched me the most personally, however, is the time I have spent with others, sharing my love for handmade crafts. It was wonderful to discover I have a niece who enjoys cross stitch as much as I do, and to discuss techniques with her. I was proud of and gratified by the growth displayed by a former neighbor, now a young lady in her 20s, to whom I taught basic sewing skills when she was a child. She eventually began sewing and selling period dresses. When I managed a Destination Imagination team, I taught six middle school boys how to thread a sewing machine, and stitch straight and curved lines so they could make their own costumes. By the time they were high school freshman, you couldn’t hold back their creativity! 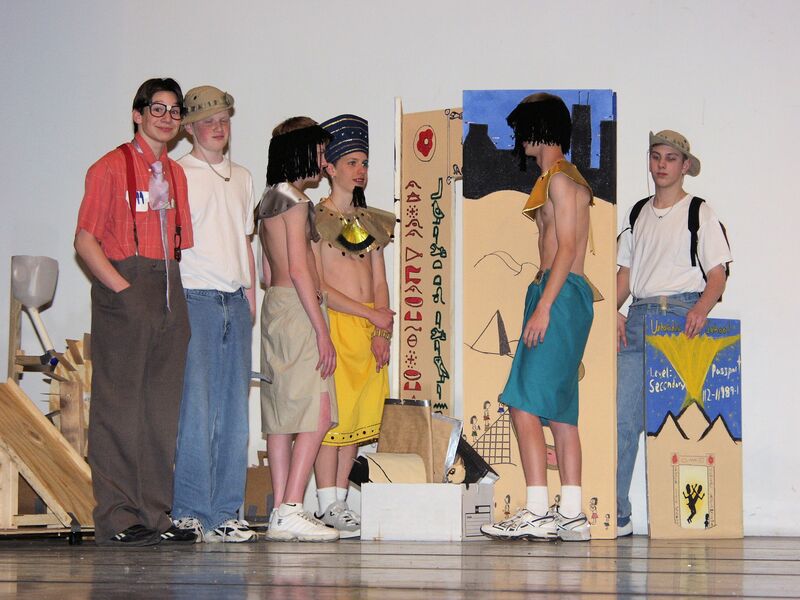 During their freshman year of high school, my team solved a challenge called StranDId involving a team of archaeologists stranded in time, specifically in ancient Egypt. With that kind of background, it’s probably no surprise that I enjoy sharing my passion for crochet with friends and family. 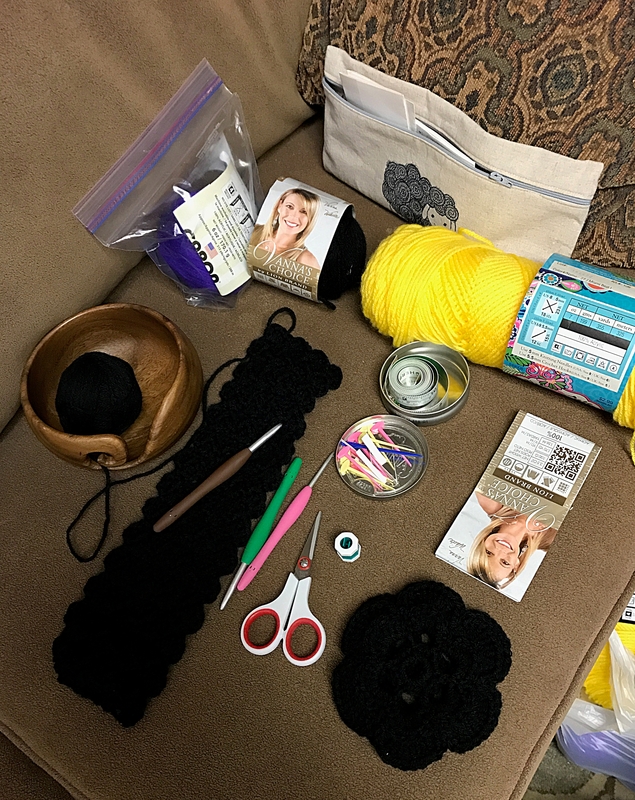 I taught a left-handed friend to crochet while we sat on her living room couch, taught my mother and husband to crochet, and even our son. Even though she was a beginning crocheter, my mother decided to tackle thread crochet. 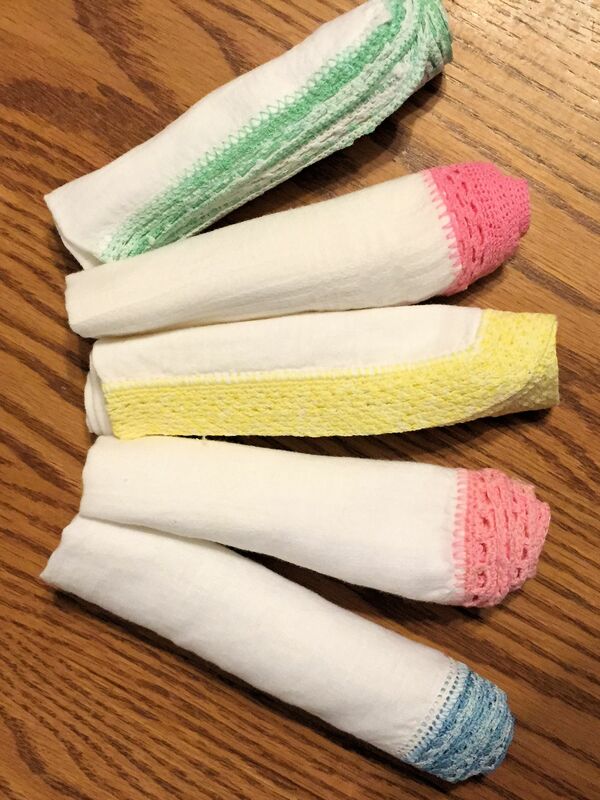 She kept herself busy during her bedridden days before she passed away by edging these handkerchiefs. “A lady,” she used to say,” always carries a hanky in her purse.” I treasure these last bits of my mother’s handiwork. Not everyone enjoys the art of hooking to the same extent that I do, so I’m never offended when I discover later that they’ve forgotten how to crochet or that it has been years—perhaps decades—since they flipped a strand of yarn over the hook. The point is that the act of teaching someone to do something you love is simultaneously an act of sharing. You’re sharing your skill, true, but you’re also sharing your passion and your desire to connect on a deeper level. 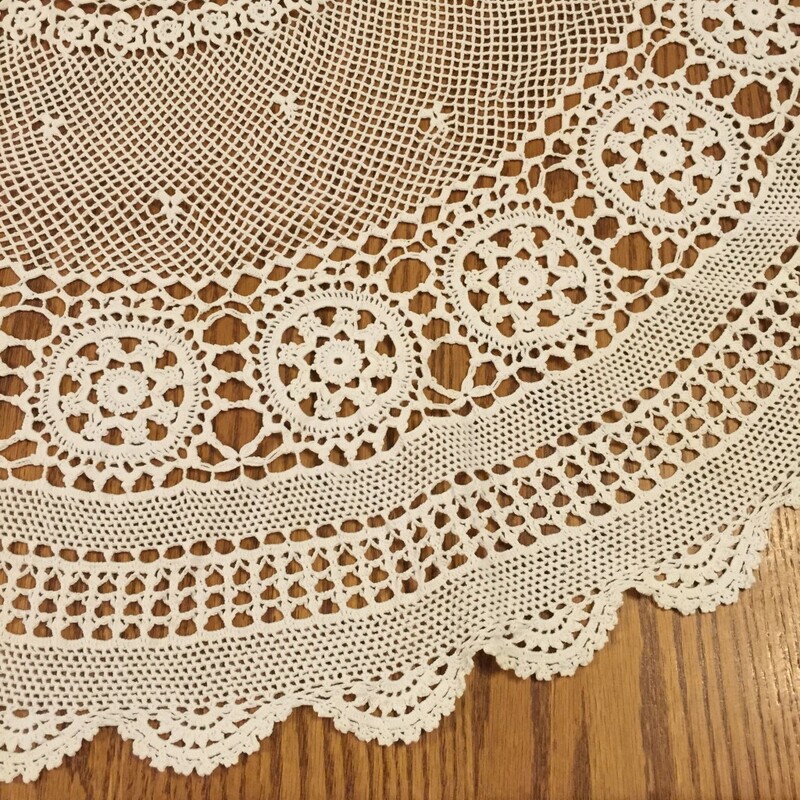 Although I never got a chance to know my German grandmother who crocheted the circular lace table cloth shown below, I’m sure we would have enjoyed each other’s company and our shared interest in needlecraft. I suspect my left-handed friend and our son no longer crochet, but have fond memories of the time we spent exploring the craft together. My husband, however, has become hooked, if you’ll pardon the over-used pun. When he was between jobs decades ago, after he had retired his commission from the U.S. Navy and was interviewing for jobs, finances got a little tight and John went through some nail-biting episodes. 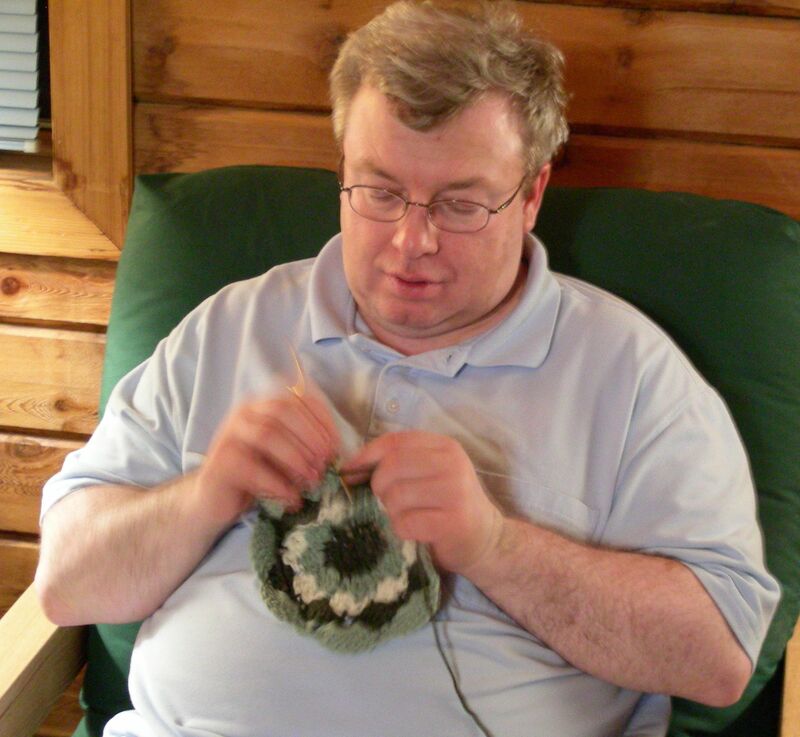 One day I suggested that it might help him to relax a bit if he learned how to crochet. At first he was reluctant, but then he agreed and asked me to bring him a ball of yarn and a hook. Although I don’t have a photo of it, his first project (like my own) was a scarf. Since that time, he has become a specialist—he crochets afghans. A side benefit is that he’s my biggest supporter when I need to shop for yarn. A down side, perhaps, is that we both end up shopping and the bill is subsequently higher. When our son was a baby, John crocheted the afghan draped over our son’s head, shown in the photo below. 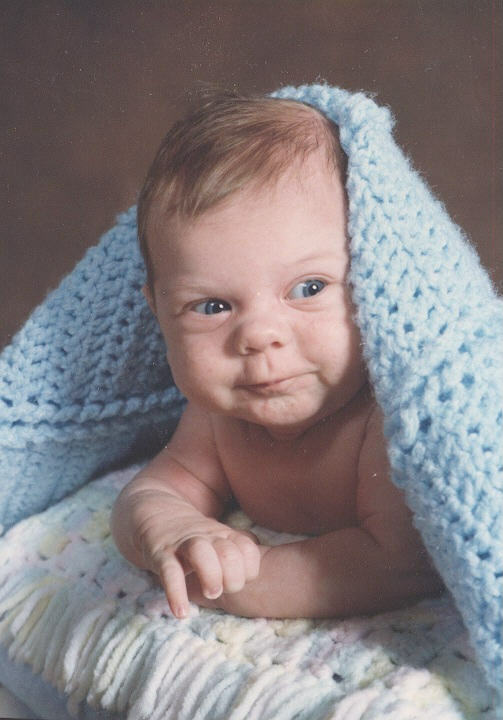 We like to say this was David’s first smile, at five weeks old, as he poses for a portrait wearing the blanket his father crocheted. Although I haven’t snapped photos of every project John has completed, I’m certain he has crocheted an afghan for every niece and nephew, our parents, and of course our own family, several times over. For the last nine years, we have rented a cabin at Backbone State Park in northeastern Iowa. Especially when it rains, out come the yarn stash and crochet hooks. I have discovered, over the years, that I am not the only one in the family who seeks opportunities to share her craft. John enjoys small woodworking projects, so when I needed a book press and a sewing frame for my bookbinding, he made them for me from scratch. What about our son? He, too, shares his passion for handmade crafts with others. After he graduated from college with dual majors in literature and history, he became a member of the Society for Creative Anachronism, an organization that specializes in researching and re-creating the arts and skills of pre-17th-century Europe. David not only practices period archery and fencing, but has taught basic bow skills to others, marshaled archery events, and taught fencing classes in the use of the rotella (a round concave shield). He fletches arrows by hand (attaches feathers to arrows), tools leather, and has even made his own period war bow—sharing these handmade passions with others through conversations, gifts or commissions. If you’re interested in contacting him, by the way, you can reach him by e-mail at davnolan88@gmail.com. 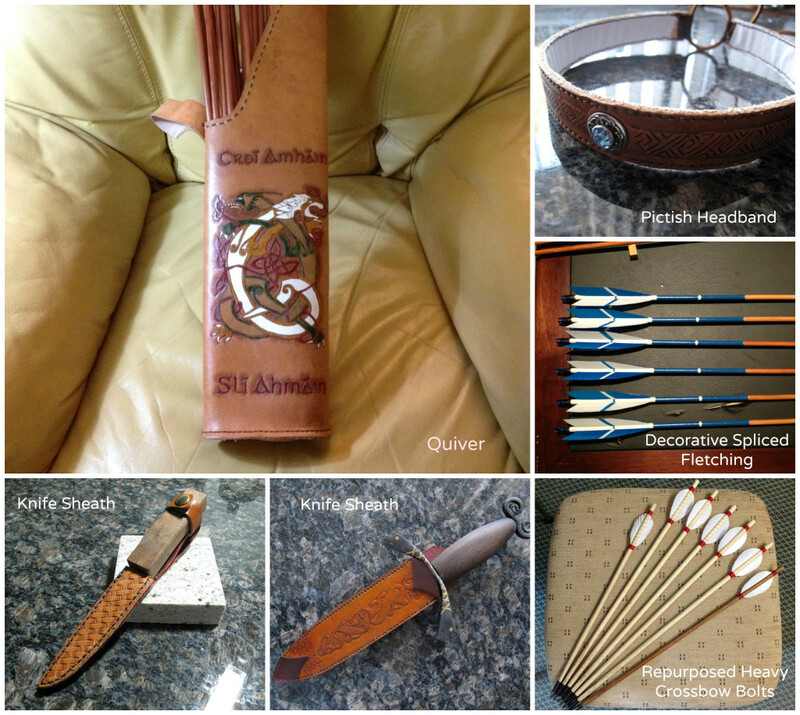 You’ll want to click on this photo to see the details in the leatherwork and arrow fletching. Although you can read a book or take a class in person or online to learn a new craft or improve your handmade skills, there is no substitute for a one-on-one demonstration. That demonstration inevitably strikes up a conversation that goes beyond the craft, leading to new friendships, new understandings, and an appreciation for both craft and person. When you share your craft with others, you forge links that cross generational gaps with ease and create memories that will last forever. What craft skill or passion have you shared lately with others?